With the league season slowly progressing towards an enthralling culmination, keeping players fit has become an imperative matter. Here are the players that need to be kept fit for one of the closest title race in years. While essentially every player is an important part for the efforts of the top four to challenge for the league, some of the most essential come in places where the biggest goal output originates from, or where the team's most significant player in helping them work together. It's set to be a thrilling title race, and here are the top five players that need to be kept fit in order for their team to be in with a chance of winning the Premier League. Luis Suarez is the Premier League's top goal scorer. With his form increasing by the day, his importance to Liverpool is imperative. The Uruguayan missed many games to start the season after his ban, but since then he has kicked on to impressive records. With Liverpool still not as close in the title race compared to the top three teams, Luis Suarez importance ranks him in #5, also considering that Daniel Sturridge can cover the duties with his goal-scoring going from strength-to-strength. Should they keep Luis Suarez fit, then Liverpool really have a chance to challenge. They are by no means down and out with 'winnable' games ahead before big clashes at home. Its players like Luis Suarez that pick up the all-important goals on their way to really put them back in a solid position. And if it goes the other way, then this counts in the same respect to Luis Suarez helping them battle for European football. Arsenal's centre-backs have gathered an impressive defensive record over the season, and this had made them of paramount importance to Arsenal's title efforts. They are not exactly a 'player' but the plural, however their importance is classed together in a partnership. There record was impeccable leading up to the beating they received at Anfield in a 5 - 1 loss. Nonetheless, their defensive partnership has been second to no-one in the league, and their form will need to continue to keep Arsenal's title hopes alive. It's a well worked partnership that has kept many attacks at bay, without one of them, they may not work as well, and without the pair, then it could spell disaster. Yaya Toure has been a workhouse for Manchester City throughout their campaign, being the biggest part of helping foil their numerous demolitions. With Sergio Aguero being injured, it is a big blow to Manchester City but no doubt they have the resources to facilitate. For instance, Alvaro Negredo and Steven Jovetic (along with Dzeko performing better) is enough to facilitate for the Argentine, whereas Yaya Toure brings a unique gel to Man City which makes everything work so well. As the power and the pillar keeping Manchester City well structured in the midfield, the Ivorian's fitness must be kept as good as possible - like we saw two years ago when he was one of the most important parts to City's historic league win. The Frenchman has been an important goal output for the Gunners as they got to the top of the table, and his striking ability makes him an important asset. What puts him high up on this list is that he along with Nicklas Bendtner are the only real strikers, and should Giroud get injured then that spells trouble for them with Bendtner taking the central role. In addition, the injury to Walcott increases his importance. There may be an increased strain on this going into Europe and other cups, the demand will be high but his body must cope for Arsenal to stand a strong chance. Well, Eden Hazard is one of the best players in the league today. The 21-year old Belgian has taken the weight from strikers such as Eto'o and Torres to score goals, create chances and continue a delightful season by helping Chelsea reach the top. Although Samuel Eto'o did score a couple of goals against Manchester United, his form is inconsistent at times, whereas Hazard delivers constantly to get all-important wins for the team. Eden Hazard has helped Chelsea into a position where the league is there's to lose, but should he get injured, that situation could be turned upside down. With the title race getting more intense by the day, these players will play a huge role - fitness is key. Can these players stay injury-free as the season approaches a climax? How important will they prove to be? 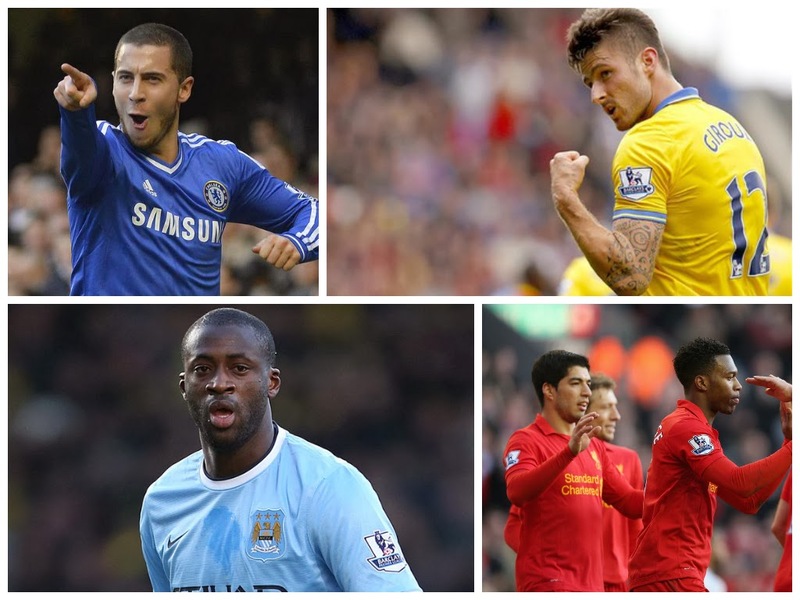 A breakdown of the key players to keep fit for the 2013/14 Premier League title race.